The nearly 10,000 square-foot American Eagle Outfitters Mira Place store includes a comprehensive assortment of on-trend fashions. Special sections will be dedicated to key categories such as AE denim, The Aerie Collections and accessories including scarves, jewellery, hats and shoes, among other seasonal essentials. 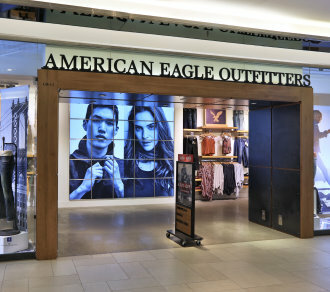 There are now over 930 American Eagle Outfitters stores in the U.S. and Canada.